LOS ANGELES -- What jinx? Sports Illustrated boldly predicted an Astros' World Series title on its cover in 2014 - after Houston had lost more than 100 games for three straight years - proclaiming: "Your 2017 World Series Champs." It featured a picture of George Springer in a bright Astros jersey. It proved to be oh so prophetic. Not only did the Astros win, Springer was named Series MVP after boosting Houston over the Dodgers 5-1 in Game 7 on Wednesday night. 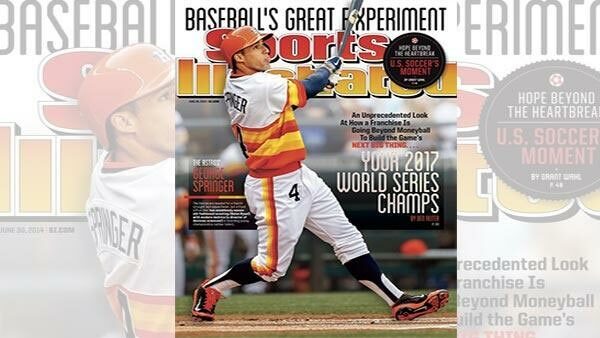 Sports Illustrated took a victory lap on Twitter, sending out an updated gif of the cover that shows Springer's uniform morphing from the throwback rainbow version to the orange tops they wore in Game 7. The tweet simply said, "Called it ..."
The SI cover has long been considered bad luck. Teams have flopped, athletes have been injured and some even died shortly after gracing the front page. The magazine had a bit of a hedged bet in this Series, of course. It also ran a Dodgers cover this summer with the headline "Best. Team. Ever?"